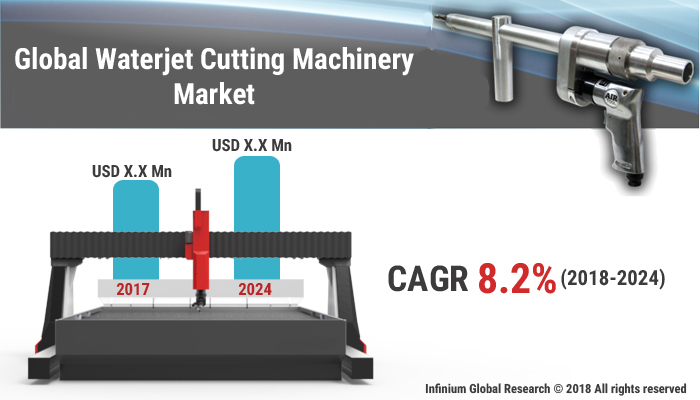 A recent report published by Infinium Global Research on waterjet cutting machinery market provides an in-depth analysis of segments and sub-segments in global as well as regional waterjet cutting machinery market. The study also highlights the impact of drivers, restraints and macro indicators on the global and regional waterjet cutting machinery market over the short term as well as long term. The report is a comprehensive presentation of trends, forecast and dollar values of global waterjet cutting machinery market. According to the report the global waterjet cutting machinery market is projected to grow at a CAGR of 8.2% over the forecast period of 2018-2024. Water jet cutting machinery is an industrial tool that is capable of cutting a wide range of materials using a very high-pressure jet of water. The water jet is often used during fabrication of machine parts and it is a preferred method when the materials are very sensitive to the high temperatures. They are used widely in various end-use industries such as mining and aerospace, textile, food, construction, electronics for cutting, shaping and reaming. Higher demand for process automation across various industry verticals are the key factors driving the growth of the water jet cutting machinery market. Additionally, technological advancement and increasing end-use applications of water jet cutting machines are likely to boost the demand for water jet cutting machinery market over the forecast period. However, the high cost involved in the maintenance of water jet may act as the restraining factor for the growth of the water jet cutting machinery market. Furthermore, the advancement of newer technologies such as multi-axis water jet cutting as well as 3D cutting would comfort the water jet cutting process to increase its capacity worldwide. This, in turn, is providing several growth opportunities for the water jet cutting machinery market over the upcoming years. On the other hand, multi-axis water jet cutting, as well as 3D cutting, would supplement the growth of the global water jet cutting machine market. Among the geographies, Asia Pacific region is anticipated to be the dominating region for the water jet cutting machinery market owing to its rapidly increasing automobile industry. Additionally, increasing industrialization because of economic growth in emerging markets such as India and China are expected to drive the market in the Asia Pacific regions. On the other hand, there is an increase in foreign investments in the countries such as India, Brazil to develop the automobile manufacturing plants that in turn is enhancing water jet cutting machinery market. Moreover, North America leads the global water jet cutting machine market owing to heavy demand from several core end users. The report on global waterjet cutting machinery market covers segments such as technology, application, product type and horsepower (HP). On the basis of technology, the global waterjet cutting machinery market is categorized into pure waterjet cutting and abrasive waterjet cutting. On the basis of application, the global waterjet cutting machinery market is categorized into automotive, defence and aerospace, metal fabrication, textile, ceramics, and paper. On the basis of product type, the global waterjet cutting machinery market is categorized into 3d waterjet cutting, micro waterjet cutting, and robotic waterjet. On the basis of horsepower (HP), the global waterjet cutting machinery market is categorized into between 0 to 50 horsepower and between 51 to 100 horsepower. The report provides profiles of the companies in the global waterjet cutting machinery market such as Hypertherm, Inc., Shape Technologies Group, Koike Aronson, Inc., Resato International BV, Jet Edge, Inc., OMAX Corporation, Colfax Corporation, Bystronic Laser AG, WARDJet, Inc, and Dardi International Corporation. The report provides deep insights into demand forecasts, market trends, and micro and macro indicators. In addition, this report provides insights into the factors that are driving and restraining the global waterjet cutting machinery market. Moreover, IGR-Growth Matrix analysis given in the report brings insight into the investment areas that existing or new market players can consider. The report provides insights into the market using analytical tools such as Porter's five forces analysis and DRO analysis of waterjet cutting machinery market. Moreover, the study highlights current market trends and provides forecast from 2018-2024. We also have highlighted future trends in the waterjet cutting machinery market that will impact the demand during the forecast period. Moreover, the competitive analysis given in each regional market brings insight into the market share of the leading players. This report will help manufacturers, suppliers, and distributors of the waterjet cutting machinery market to understand the present and future trends in this market and formulate their strategies accordingly.